The volume is the space that a figure occupies so to find the volume of a rectangular solid multiply the length times the width times the height of the rectangular solid. Length times width is the area of the base and that is stacked on top of itself to fill up the solid which is why you multiply it times the height to get the space that the figure occupies. Surface area is the area of all of the surfaces added together. A rectangular solid has three pairs of congruent parallel faces the top and the bottom are exactly the same and parallel to each other The left and the right again congruent and parallel and finally the front and the back are congruent and parallel so to find the surface area of a rectangular solid find the area – length times height of the front or of the back and since there are two faces exactly like that the front and the back you multiply that times two plus two times width times height. Width times height is the area of the right face or the left face and since there are two faces that have that exact same area right and left you multiply it times two. Finally, add two times the width times the length. The width times the length is the area of the base for the bottom and it’s the same as the area of the top so again two faces with the same area so we multiply that times two. So when we add all those together, we get the surface area or the area of all of the surfaces of the rectangular prism. Let’s look at an example. 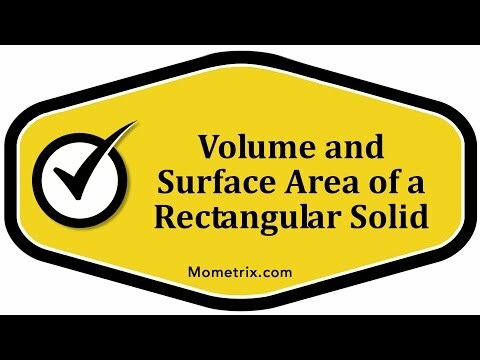 Find the volume and the surface area of the following rectangular prism. Let’s start with volume. The first thing we’re going to do is write our formula. Volume is the length times the width times the height. Now we need to substitute our length, width and height. The volume is – the length is seven inches times the width three inches times the height five inches. Seven inches times three inches is twenty one inches squared. Twenty one inches squared times five inches is one hundred five inches cubed. And that cubic unit again came from multiplying inches times inches times inches. A volume will always be in cubic units. Now for surface area. First again we’re going to write down the formula so surface area is found by multiplying two times the length times the height plus two times the width times the height plus two times the width times the length. And now we’ll substitute in our dimensions. Surface area is two times the length seven inches times the height five inches plus two times the width three inches times the height five inches plus two times the width three inches times the length seven inches. Then we need to simplify according to our order of operations which means we need to multiply first before we add. So the surface area is and these three numbers can be multiplied in any order so you could do two times five inches ten inches then times seven inches seventy inches squared and that came from your inches times inches. Plus two times three inches times five inches two times five inches ten inches, two times three inches thirty inches squared plus two times three inches six inches times seven inches forty two inches squared. Finally, we can combine these all together for our surface area. The surface area is seventy inches squared plus thirty inches squared is a hundred inches squared plus forty two inches squared.